Being a Cavite-born-and-raised kid, I find it quite difficult to point out things that only #TrueCaviteños will understand since those are things that I grew up being familiar with and what I thought were normal. So if you’re Taga-Cavite, read on and find out what makes a true-blooded Caviteño different from the others. 1. We’re creative with our words. a. “nakain” is the same thing as “kumakain”, like how “naulan” means “umuulan”. c. “dia” is not something we made up. Like c’mon, it’s a shorter version of ‘di ba’! 2. We’re not angry all the time, we promise! There’s also the issue about how we have an accent different from everyone else. “Bakit ang daming punto ng salita niyo?” Walang basagan ng trip. 3. Cavite is the #1 Go-To spot for chibugan. I can’t even deny the abundance of cafés, grill houses, or even the simple tapsihans here in Cavite. Up for a barbeque night? There are grill houses like Angelo Barbeque + Drinks and MRP House of Grill to satisfy your taste buds. Coffee and chill weekends? Cafés are all around the area like Subi-Monte Café, Café Antix, Black Apartment, and Café Moraco. Even Tagaytay’s only a short drive away. Every conversation is a plethora of names, especially when you’re eating. I’m not sure how it became small talk reserved for the dining room, but there will always be a “Kinasal na pala si Amy kay Jim.” “Sinong Jim?” “Jim, anak nila Aling Cora.” “Aling Cora sa Caridad? Pakisabi congrats.” whenever we eat. Always. 5. Remember the Iconic Gov. Jonvic Remulla? Known as Gov. Pogi, this governor rose to fame because of how creative his announcements were, especially when suspending classes. It was so witty that even students outside Cavite started looking out for his announcements. He was even featured by different publishers! 6. We can all relate to the Tollgate Traffic Madness. Caviteños who study/work in Manila, this one is for you. Morning classes sound fine until you realize that you have to be sitting (or standing) inside the bus at 5 AM to make it to your 8 AM class. But make sure it’s 5 AM sharp, because a minute late, you’ll find yourself stuck in the toll gate traffic at 9 in the morning. I mean, how would someone even answer that? Kidding aside, I’m sure not all Caviteños are familiar with the whole Cavite province. 8. We’ve got the Baby Bus. Anyway, yes, baby buses are a Caviteño thing. 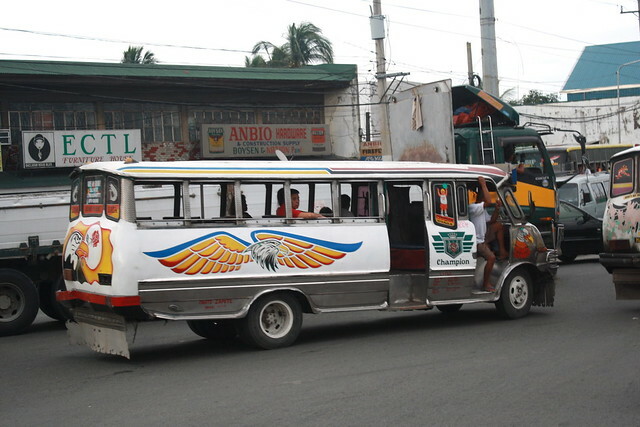 I remember taking my Manileno friends in Cavite and after making them ride the baby bus, they immediately started calling it ‘the demon bus’ because of how fast it went. They never rode it again. 9. Who doesn’t love Pat and Sam Rice Cakes? That’s it, that’s the whole story. Because if you’re from Cavite, you would know how words aren’t enough to describe how beautiful the samala rice cakes taste. Photo from Pat and Sam Delicacies Facebook Page. 10. Mall-hopping is a thing. Shopping malls are everywhere, and with everywhere I mean we have malls located only 30 minutes to an hour apart. There’s SM City Rosario, BDO SM City Trece Martires, SM City Dasmarinas, SM City Molino, SM City Bacoor, Lotus Mall, Ayala Malls Serin, Lumina Point Mall Savemore, The District – Imus, The District Dasmarinas, V Central Mall, CityMall – Imus, Portal Mall, Walter Mart Trece Martires, Walter Mart Carmona, Premier Plaza, Elements Mall, Robinsons Place Dasmarinas, Robinsons Place General Trias, and Robinsons Place Imus. That’s twenty malls. TWENTY. So there you have it. If you’re from Cavite, I’m sure you’ll find some (or all) of these relatable! Dang-proud na Caviteño ‘to! Let us know your #GoCavite stories by sharing this article on Facebook and by leaving a comment below! Im also a caviteño for almost 1 year only (1998-1999). Then going to Calamba,Laguna from 1999 up to present. May kulang po.. hindi nabilang kung ilan ang Alfamart at Puregold.. Also dito sa Cavite if you want to get re-fueled go to Petron gas stations. Literally, if you wanna get drunk theyre open 24/7… the place to be…..
Hey writer. Ung number 9 mo po pang only from Cavite City knows. As i remember you must turn right before SM Bacoor when youre from Coastal or Zapote. Or turn left after SM Bacoor when youre from Imus. Way going to Cavite City as I remembered. You forgot to include the native dance of Caviteños, “Bakte” which the KMJS TV Program featured a week ago. In no.1-c the term “dia” i thought it’s not a shorter version for “Di ba?”, it’s for “Hindi ah”. Dang right you are Karen! May bagong mall pa na tinatayo sa alapan. At maraming alfamart kht saan.. Haha! Chili – a mans pride. Ex: Parang mali, aw parang mali. sometimes we used the word “eh” even we r not batangeño…. Cavite is the place to be.. i gew up here .. go to cavite and you will love to stay here..Cavite lang kami.. go cavite ..go cavitenos and cavitenias.. True blooded Cavitenio really a good person to be with we’re honest inside and out. you are indeed a true blooded Caviteño Karen it’s in your genes to write good articles like this Keep it up! “NAPURUNGGO ako sa BANGBANG kase kinuha ko ang KAMPET na nahulog sa tubeg, nabasa tuloy PUNJO ng KARAUSILYO ko DANG baho! Hindi ako taga cavite pero ipinagmamalaki ko ang mga tao sa cavite sa pagiging warm.taga antipolo kami ng nanay ko ay nagtitinda ng kasoy at suman sa naic, salinas, tanza, at marigondon. Nakapagbakasyon di ako nung higj school ako sa salinas kanila nanay ising sa wawa at naranasan ang karakol, pagtitinapa…marami kaming mayayamang customer n ni isa ay walang nangmata bagkus open arms nila kaming tinanggap maliban sa isang taga tanza babae n nakapag asawa ng isang engr n tubong cavite… si engr p ang humingi ng paumanhin sa aking nanay…si kuya romy na may ari ng rural bank ng naic.memorial at mga school ay isa sa pinakamabait at simpleng mayaman n nakilala ko sa naic cavite.minsan nadukutan kami ng pera at walng pamasahe papunta ng cavite nasa baclaran n kami nun.walang magpasakay sa amin n baby bus papuntang naic, pero ng binanggit ni nanay ang pangalan ni ate nene agad kaming pinasakay at pinalitan n lang namin ng kasoy ang aming pamasahe…mababait ang mga taga cavite at malalambing!!! Dang! I can’t disagree with #2. Haha..
Sa ngayon tila kakaunti nalamang ang taal na taga Cavite. Maraming Caviteno ang nagnavy, kayat nadala ang buung angkan sa tate. Dito sa Imus, halos wala na akong masyado kakilala. : San ka sa cavite? : saan nga sa cavite ? me: sa cavite city nga po! : ah sa Dasma ba yun or sa Bacoor? sa amin sa cavite nang gagaling ang mga tinapa na ibinebenta sa baclaran at divisoria..at saka ang pinaka paborito kong longganisang imus,saan ka makakakain ng fresh na tahong at talaba…ndi ka taga cavite pag ndi ka marunong magbukas ng talaba..marami pang iba..
Nice read! Correct if i am wrong but I believe “dang” means “ubod ng” as in “ubod ng ganda”, “ubod ng traffic sa coastal” and so on..also, there is sabongero in every family.. foods called parasyon (monay), kampitis (kornik) among others..Mabuhay ang mga Caviteno! *i mean correct me if i am wrong…by the way, keep on writing about Cavite Karen.. Good job! Bwakanenang yan. Hindi taga kabite pag hindi alam ang mga yan. pag hinabol ang caviteño, mahirap abutan sa dami ng pwedeng labasan. Saan mo gusto? Las Piñas, Parañaque, Batangas, Laguna. Sayang, wala na yung ferry pa maynila. Im on my 50s now.. mga early 70s kung pupunta kami ng .. Dasmarinas.. ang ang gamit namin ” Mariñas” pero now.. Dasma . Na. them: saan ka sa Cavite? them: oo nga, san ka nga dun? them: (long pause), ah iba pa ba yun sa Dasma? Karakol kapag may okasyon especially sa mga Katoliko. Ms. Karen Signo….. talaga bang taga Cavite ka? o immigrant? kasi kung talagang taga Cavite ka, your article should have many more things that you should mention or write. You should explain where Cavite City is, based on what you’ve written you yourself doesn’t know where Cavite Ciity is. Ang dami mong hindi nabanggit like, Digman Halo-Halo, paborito sa buong Cavite na ang kapartner he siopao, bibingka galapong sa Binakayan, , sinampalukan native na manok, originally Caviite talaga. Mga salitang tulad ng prunggo ; papagayo ; nanggigitata, naglalamira, namumugigi, saramulyo — oh alam mo ba ang mga salitang ito? kung hindi mo alam, hindi ka taga original na Caviteno..
UMAANGE (TAGALOG)-UMAAM PIYAS or AMPIYAS- ex: pumapsok yun ulan sa loob ng bintana- sarhan ang bintana umaapiyas ang ulan. Anu sa tagalog nito >>>>> pre –purunggo – bleed to bits of broken glass – ingat ka baka ka mapurunggo. OLD STYLE of CAVITENOS –70’s- kulduroy, hush puppies, scarf, open polo sleeve 2 buttons tie.